It looks like buyers were not going to wait for a retracement back to the trendline before jumping in as EUR/USD found a strong bid during the Asian trading session and rallied almost 100 pips from 1.4660 to 1.4750. Needless to say, our trade orders were not triggered, so we will close open orders. No trade. Keep a watch on 1.4750 as it appears to be holding for now. US CPI data may change the short term sentiment, so keep an eye out for that as well. Stay tuned! Tonight, I like the price action in EUR/USD as it has been trending higher since last week. Weak US data on top of Bernanke’s testimony to the US Congress signaling more rate cuts has been the spark to US Dollar selling, and that sentiment may continue into this week’s US CPI data (Wednesday) and Eurozone PMI data (Friday). 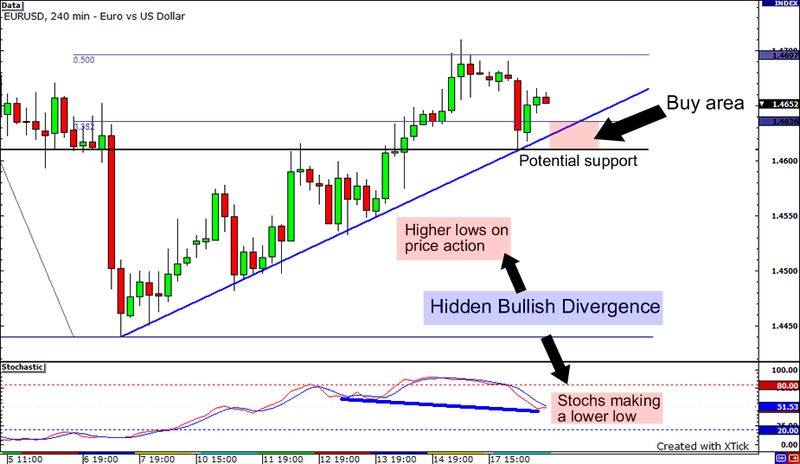 On the chart, we can see a bit of hidden bullish divergence as price action has been making higher lows, while stochastics is forming lower lows. Also, we may support just above 1.4600 as the pair found buyers there at a recent test of that level. Remember never to risk more than 1% of your account on any single trade. Adjust position sizes accordingly.